Summer – The rains finally come, and it rains almost every day for several months. Rain turns everything green, grasses grow where there were just dirt fields and slopes, more grass than the animals can graze. The rain also means crazy lightning storms with hail pretty regularly. And my least favorite part – the mud. It makes me wonder why I ever wished for rain to settle the dust. Mud is much worse, it becomes very difficult to stay clean for more than an hour, and I am continually slipping down my muddy slope to the road. I remember waking up one night to the sound of a full river and a newly formed waterfall, just after the first rains of summer had begun. Fall – Everything is in bloom, there are clematis flowers everywhere and ripe maize (which means roasted maize, as much as I can eat!). The rains finally stop, or at least become much less frequent, and things begin to dry up. I have to go to the river again to get my water because there isn’t rain to fill the barrel behind my house. I spend at least an hour everyday pulling thistles and burs off my dog or myself, they’re everywhere. There is a chill in the air that feels nice after the summer heat, and an early frost that kills off my promising tomato plants. Winter – You can almost tell the exact day winter begins, the sky is cloudless and the air has a bite to it. People sit (and nap) out in the sun during the day, soaking up the warmth. At night I wear long underwear, a sweatshirt, two pairs of wool socks, and am still cold underneath my sleeping bag and two blankets. It’s not Michigan cold, it only snows occasionally here, but without heated buildings it’s a bitter cold that gets into your bones. The days are also shorter, and I’m sequestered in my house for three more hours of darkness every day. But this winter, in July, it also means a trip home to the U.S. where it’s summer, with swimming in Lake Michigan and picnics in grassy parks! The contents of this article are mine personally and do not reflect any position of the U.S. Government or the American Peace Corps. 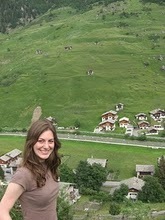 Juliana is an courageous American Peace Corps volunteer stationed in Lesotho. She very capably, heads up Maliba Lodge's community outreach projects and teaches "life skills" at the local schools. 50 Chickens! Likhoho li teng! 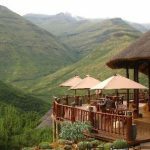 Maliba Lodge is the first and only 5-star luxury Lesotho accommodation in Southern Africa. It is located in a pristine national park in the heart of this Mountain Kingdom. The Blanket Wrap was created to promote the wonders that Lesotho has to offer. © 2018 - All Rights Reserved. Maliba Lodge.